Another Icon in the business leaves us way to early. RIP Davo. I'm at a loss for words... I spent the last hour trying to think of something to say here. I will miss Davo a lot. He was a one-of-a kind guy. An incredible craftsman and just plain hilarious to be around. I think he'd want us to laugh as we remembered him, but I'm having a hard time doing that right now. I'm sincerely sorry for the loss of your friend. My thoughts exactly. I didn't know him, but it is always tragic to lose one of our own. Especially one that was such an influence and so well loved. Very sad. He was such a good and generous guy. 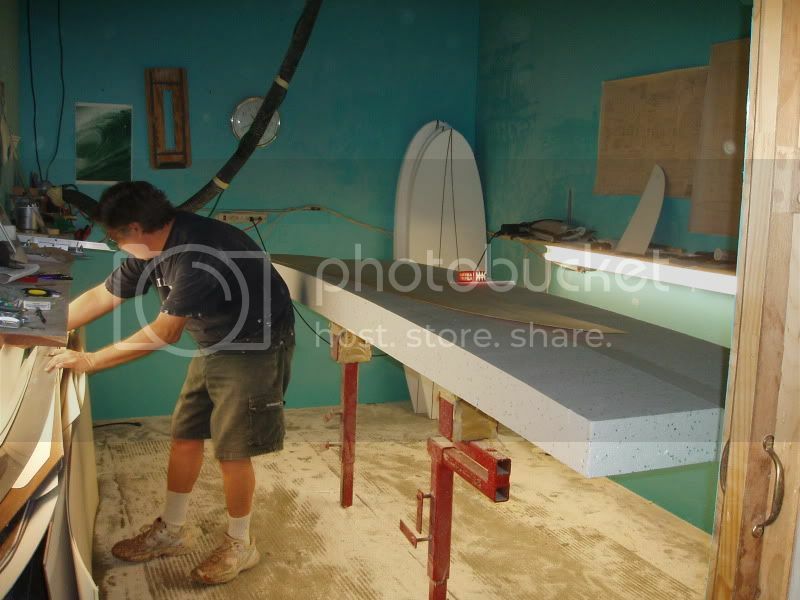 He let me do my first resin swirl in his shop on a 11-6 combo paddle/surf board that he shaped for me. I won my division and a couple above me on it for the Watermans Challenge short distance paddle event. A great board. He was really pleased when I told him. I will find some pictures tonight of him and me during the glassing and post. I showed up in flip flops to glass and he was graciously hovered over me to ensure I didn't screw it up. GL, could you comment on some of the giant boards he built for display in the Cocoa area? One of my last things on my bucket list before leaving Fla. was to take all my chemicals and cloth to Davo, along with the last shaped blanks which he glassed and then delivered on one of his trips up the coast. Here are a few pictures of Dave in his factory. The board is 11-6. Stringerless. He sort of specialized in really big boards. Notice the little fish in the corner. He built a million of those and sent them all over the east coast. It was sort of his signature board. His glassing shop was tops. Dude, can we use one of these pics of Davo for our poster for the 2013 Florida Shape Off at the Expo? The contest for this coming year will be a tribute to Davo who was one of the participants of the 1stFlorida Shape Off we held (back in 2008). 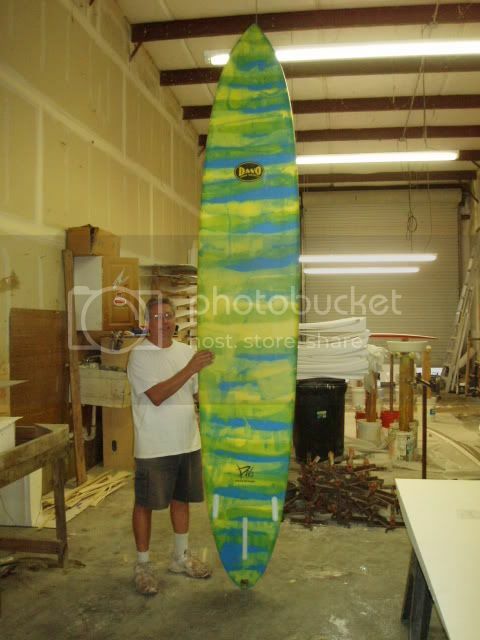 For into on the contest go to http://floridashapeoff.com We will be using one of this boards as the one the shapers have to replicate. Please let me know asap as I have to send the artwork for the poster in. email me with an ok at - it's the email I check most often. Yeah Greg, Dave made a few of those giants ... like building a boat those. I think he did those at the Pineda factory. Used to go have lunch with he and Binky at the Pineda Inn right there on the river. Dave was one of a handful of guys I've worked with for over 40 years. Surfed on the Hobie team with him in the early 70's ... toured the coast with GP. Went to Hatteras for the championships in 71 with Dave, GP, Mark Crowl and LP. Always that great sense of humor .... real craftsman ... one of the very best.